fits firm without any movement. Comes with 2 extra rubber insets for different bar sizes. Good looking thin, light weight, slim. An affordable alternative to the Garmin brand name mount,half the price for garmin equivalent and better quality. Put you and your data ahead of the pack with this extended out-front bike mount. This bike mount allows you to take full advantage of all of the robust cycling performance data that Garmin Edge provides without compromising the ride. This mount enables your Garmin Edge to besecured in front of your handlebars for easier, heads-up positioning andincreased safety. Enables you to easily view performance data on your computer. This mount is easy to install by yourself in 2 minutes. SOLID GARMIN EDGE MOUNT - This slim bracket fits Garmin Models perfectly without any movement,Secures your Garmin Edge GPS Bike Computers in front of your bike handlebars,an effective mount for the Garmin. GREAT VIEWING - Enables you to easily view performance data on your Garmin Edge GPS Bike Computers, Gives you an adjustable viewing angle for your bike computer,holds Garmin at a an angle that is very convenient and visible to the rider. QUICK & EASY TO INSTALL - Mount on your bicycles handlebars in under 2 minutes with the installation kit. Unlike competitors garmin mounts our mount features a hinged opening for ease of installation. In addition, we include 2 extra rubber bushings to ensure our garmin mount fits most handlebars size. 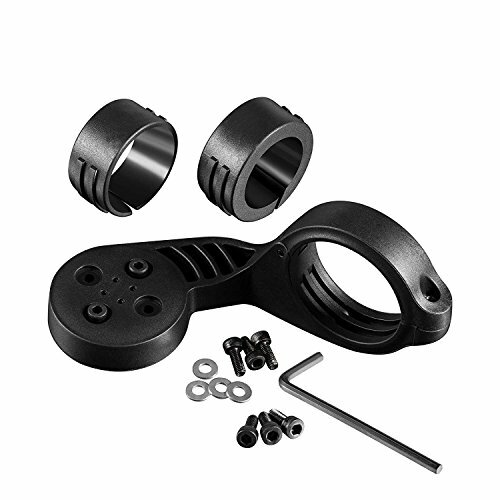 STURDY & SECURELY - Too Goods bike mount for garmin is made of good quality plastic construction,Heads-up positioning provides increased safety,sticks out from the handlebars which allows room for a small handlebar bag and allows for better viewing of the garmin. HIGH COMPATIBILITY - Compatible with Garmin Edge 1030, 1000, 810, 800, 510, 500, 200, 25, 20.,iGPSPORT computers GS20 20P 60 igs 10. If you have any questions about this product by Too Goods, contact us by completing and submitting the form below. If you are looking for a specif part number, please include it with your message.